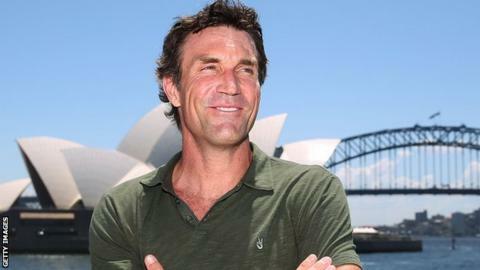 A Ryder Cup-style competition for men's tennis may struggle to win player support, according to former Wimbledon champion Pat Cash. Teams from Europe and the Rest of the World will compete annually for the Laver Cup, named after 77-year-old Australian tennis legend Rod Laver. The inaugural edition of the event is scheduled for September 2017. "I like the concept but I don't know if players will take it seriously," Cash told Radio 5 live sports extra. The tournament organisers say each six-man team will be captained by a "a legend of the sport", who will pick two wildcards to add to the four players who qualify through "a results-based formula". The 12-match competition will take place over three days, with each day featuring three singles matches and a doubles match. The tournament is the brainchild of Team8, the management agency of 17-time grand slam winner Roger Federer, Tennis Australia and Jorge Paulo Lemann, a Brazilian businessman who represented both Brazil and Switzerland as a player in the Davis Cup. Cash, who won the men's singles title at Wimbledon in 1987, believes the timing of the tournament will discourage the top players from signing up. "The concept is a great idea, but it's after the US Open and the Davis Cup [semi-finals] - it's stuck in the middle of a tournament," he said. "With the Davis Cup struggling in some places in the world, I'm not sure we need another tournament to squeeze in."